You searched for which does not fit your . We've redirected you to 130-803, which has the proper fitment. Great for day or night riding. no glare from oncoming lights at night is wonderful! Bought these obviously for night driving instead of clear lenses. The amber glow of headlights gives you a sense the head light are not as bright. The bi-focal is not progressive and is smaller, so you kind have to aim your head and eyes to use them. They are good for limited use but not a substitute for a average glasses from an optometrist. Good fit, seem to work really well. Provide good vision & allows me to carry only one pair of glasses. 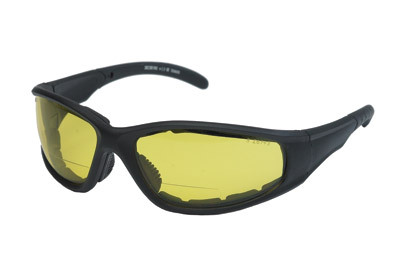 Lens color is perfect for night riding but still provide adequate protection during the day. Awesome!!! Fit nice and great for night time riding. They are somewhat bright during day time. That why I got the BLK/SMK.